This artist's rendering shows NASA's Juno probe at Jupiter, with its solar arrays and main antenna pointed toward the sun and Earth. 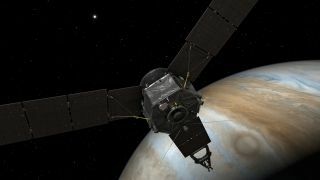 NASA's Juno probe will attempt to slip into orbit around Jupiter tonight (July 4), shortly after becoming the fastest object ever made by human hands. As Juno nears Jupiter tonight, the giant planet's powerful gravity will accelerate the spacecraft to an estimated top speed of about 165,000 mph (265,000 km/h) relative to Earth, mission team members said. The all-time speed record is currently held by NASA's Helios 1 and Helios 2 spacecraft, which launched in the mid-1970s to study the sun. Both probes reached top speeds of about 157,000 mph (253,000 km/h) at their points of closest approach to Earth's star. For perspective: Bullets cut through the air at about 1,700 mph (2,735 km/h), and the International Space Station zooms around Earth at 17,500 mph (28,160 mph). Indeed, Juno will be moving a bit too fast for its own good tonight. To slow down enough to be captured into Jupiter orbit, the probe must slam on the brakes, which it will do by firing its main engine for 35 minutes, beginning at 11:18 p.m. EDT (0318 GMT) tonight. Bolton said he's nervous about this make-or-break maneuver, which Juno will perform on autopilot. "If that doesn't all go just right, we fly past Jupiter," Bolton said. "Everything's riding on it." The $1.1 billion Juno mission launched in August 2011. The solar-powered probe is equipped with nine science instruments, which it will use to map the gravitational and magnetic fields of Jupiter and characterize the planet's interior structure, among other tasks. Juno's observations should help researchers better understand how Jupiter formed and evolved, mission team members have said. If all goes according to plan tonight, Juno will enter into a 53.5-day orbit around Jupiter. The probe's handlers will then commission the probe's instruments and use them to study the giant planet over the next few months. The real scientific action, however, doesn't start until October. On Oct. 19, Juno will perform another engine burn to shift into a science orbit, a highly elliptical 14-day loop that will take the probe within 3,100 miles (5,000 kilometers) of the Jovian cloudtops at closest approach. Juno will then take Jupiter's measure over the course of more than 30 orbits before ending its life with an intentional death dive into the planet's atmosphere in February 2018. This final maneuver is designed to ensure that no Earth microbes contaminate the ocean-harboring Jupiter moon Europa, which astrobiologists regard as one of the solar system's best bets to host alien life.